Your PDF form can collect information in as much detail as possible, but sometimes users don't have to fill out all the information. For example, in your PDF, it might contain some messages: If you choose answer A, skip to question X. In the form, if the user meets certain criteria, you may also need to pre-populate some questions. Or, you may want to summarise the values of some questions and fill it in another question. From now on, you can use conditional logic to perform these operations more intelligently. Set the value to a question. Copy the values from another question. Calculate the value and fill in the question. Jump to the page in the web form. Any logic can have multiple conditions to trigger a logical operation. For example, if question A is answered and question B answer is equal to "Foo", the logic is triggered. In a logic, these triggered actions can of course be multiple. For example, if the conditions match, then question A is hidden, question B is pre-filled, and so on. Here is the fourth video in our tutorial series. If your PDF needs to be filled out in multiple steps by different people then Workflow can help you with this process. For example, if the PDF requires the customer to fill in their information but also needs the manager as well as the company to sign off the form, it can become a tedious process to pass the form around and may result in loss of information. Workflow is designed to help break up this process into steps where the PDF is passed on to the different parties to fill out, resulting in a fully complete the PDF. Here is the third video in our tutorial series. If you have many PDFs that requires to be filled with lots of shared information, it may be very tedious to fill them each out separately. Master form targets this problem and is a type of form that speeds up this process significantly. It works by first creating an online form that contains all the information that is required – called the master form, then linking this form to the various PDFs that required being filled out. When the master form is submitted, all the corresponding information in the linked PDFs are filled out accordingly. In this tutorial, the steps to creating a master form and linking it to 2 other PDFs will be shown. In the previous version, PlatoForms sends e-mails to the e-mail account you use for login in, so all your team members will know when your form got submitted. Now you can add up to 10 different e-mail addresses in the form of notification recipients. Furthermore, you can select the fields in your form, if they have a valid e-mail input, so the email can be sent at the address you mention. Here is a good example of how you can use this feature: if you want your customers to receive the PDF immediately after they completed the form. You can add an e-mail field in the form and ask them to fill in their e-mail address. All e-mails will have the completed PDF as an attached file, so the recipient of such an e-mail doesn't need to log into PlatoForms to download the PDF manually. When it comes to PDF files, some text fields are designed for writing letter by letter in connected text cells; one cell being made to suit one letter or one number. For example, a driver license number or passport number etc. Before this feature was created, in order to come up with a tidy PDF containing such text format, you had to create much smaller text inputs and the user could only input the characters one by one, jumping from one cell to another. Now you can simply adjust the space between the letters, spreading them into those text cells in a neat and even manner, after typing them all at once. Here is the second video in our tutorial series. In the last video, we introduced what Platoforms was about and we also demonstrated how to build an online web form. In this video, we will be talking about another type of form for your PDF called the PDF online form. It is fillable from the web browser and unlike the online web form, this type of form looks exactly the same as the original PDF when opened. Each field in the PDF can be filled in online and submitted, producing a PDF copy of a filled out form. It is suitable for PDFs that has a more complex format with many descriptions or if the content of the form is affected by the format etc. As compared to the online web form, it is much more detailed and retains the image of the original PDF, however, unlike the web form, it is not as mobile compatible and may take longer to load this PDF as the form background. We will release a couple of tutorial video to help our customers quickly understand what is our service and how to use our service. Here is the first video in this series. PDF forms is an extremely common way of communication between businesses and customers, but the actual steps between handing out the form and collecting an actual PDF file that easily stored is not that simple. Customers often provide either an image or scan of a handwritten form as they may not know how to fill out a softcopy, making it extremely difficult to sort and manage such information. PlatoForms has been designed to solve all these issues by allowing you to convert PDFs to a clear and simple online web form that is easy to complete and comes back to you as a PDF containing all the information. This tutorial will demonstrate how to convert a PDF form to an online web form. When you create a form or PDF with our drag-and-drop editor, the skills you acquire may help you work quicker and smarter. Some of the keyboard’s shortcuts are system-level preset standards, such as “Copy” and “Paste”, “Undo” and “Redo”, and select all. Others are special shortcuts for most of the drag-and-drop software available these days, such as holding down “Shift” and dragging the mouse. Double click the desired widget: If this widget belongs to an option list of choice or Drop-down, all the options widgets in that list will be selected at once. If you will learn all these shortcuts and keyboard, plus mouse, combinations, you will be more effective at getting your tasks done. It may seem daunting at first, but once you get the hang of them, your hands will learn to perform them in almost an automated manner. You will be able to save time and effort and get your forms ready in no time. Note: The current Copy, Paste, and Delete operations are applied only when one widget is selected. Zapier is extremely easy to use and currently is the most popular method to interconnect your favourite applications. With only a few clicks, the tools you use most frequently will hook up and data will flow through from one to the other in an automated manner. Now, we are excited to let you know that PlatoForms is officially integrated with Zapier as well. It brings the full power of PlatoForms to more than 1,000 applications! When the submission of your form is successful, PlatoForms simply creates an afferent PDF and triggers a Zapier flow (which is called a “zap” by Zapier). Also, don’t be afraid to use your imagination and create your own zap, according to your needs, when it comes to automating your work. For example, you can send a Slack message to your team, import data into a Google Sheet, and upload a PDF to your CRM system! Here is a step-by-step guide that will show you how to create a zap for uploading the submission data into Google Sheets or upload PDF files to Amazon S3. You can start everything we talked about free of any charge! Except for our new Zapier integration, we have updated our API to version 4, it is fully compatible with Swagger, check it out here! As you may know already, all of your forms are listed on the dashboard. But, even so, it may be a little bit difficult to find a specific form, especially if you have several forms. We decided to make things better for you; so, recently, we totally rewrote the dashboard for a much-improved user experience. With this occasion, we added a new feature that allows you to create folders. In the dashboard, you will see three tabs now, i.e. PDF Forms, Master Forms, and PDF Files. According to your needs, you can now create a folder for each of them. After you create a folder, just click on it to access it. Once you do this, the form or PDF file you will create will be automatically saved in this folder. You also can move the form or file from one folder to another, by using its context menu: position the mouse over the cover, clicking on the Gear icon, then choose the “Move to Folder” option in the menu that opens. Besides the new folder feature, our new dashboard brings in other types of features as well: you can sort the covers by Name, Created Date, or Modified Date. In the previous version, in your PDF form builder or PDF file builder, if you wanted to change the font size, style, or colour to all your PDF widgets, you had to modify them one by one. Now, all of the builders feature a Style button on their top navigation bar. By clicking on it, you can change the font attributes to the desired widgets at once, within one PDF attribute panel. It features an advanced option as well, allowing you to decide if these changes also apply to the existing widgets or not. Upon your form receiving a submission, PlatoForms will send an e-mail notification with a PDF attachment. You also can download the PDF from our Submission page, by accessing directly. Also, from now on, we provide an additional feature: you can integrate our system with your favourite cloud drives! This way, the generated PDFs are automatically uploaded to the assigned cloud folder once your form got the submission. The list of cloud drives supported by our platform includes Dropbox, Box, OneDrive and Google Drive. To set up the preferred cloud drive, login to our dashboard, move the mouse over the form you want to synchronise with the PDF files, select the Cloud Drive option from the pop-up menu, and then follow the instructions to log in the cloud drive with the help of your account and authenticated permissions. Note: this feature is only available to our non-free plan or trial users. Feel free to contact us even if your trial version is already expired but you’re keen on testing this brand new feature! Our form builder was enhanced so that it can answer to your requirements in a more professional and specific manner. Now, all form widgets can simply be copied and pasted (Windows: CTRL-C, CTRL-V; MacOS: CMD-C, CMD-V), just as simple as that. This is a feature that can be used across any page within the same PDF. In other words, feel free to copy a widget from one PDF page and add it to another PDF page. We introduced the alignment guidance feature, which allows you to quickly align the widgets. While dragging or resizing a widget, the alignment lines will indicate if it is aligned with other widgets next to the borders or middle area in a visible manner. If you drag and drop a widget in the proximity of another, it will automatically snap in a place that is in the proximity of the closest widget. If you want to disable this feature, just press and hold the SHIFT key when dragging widgets. In PDF, you can use keyboard arrow key to move the widget by pixel ad pixel. It doesn’t matter what form builder you choose to use, as these features are present in all our builders, for example, the Web form builder, PDF form builder, Master from builder and PDF maker. So, have fun at making your own tailored form! Non-Expiry Token and Session Authentication are supported, plus OAuth2 authentication in version 2. Why is the new API better? It boosts the potential of PlatoForms when merged with your in-house system, improving your work process. Let us take one scenario, in which your organization has data that needs to be printed on various pre-designed PDF files. With the help of PlatoForms, you simply upload the PDF files and use the drag-and-drop form builder to create the web form. Then, API comes into the scene, allowing you to post the data and generate the PDF files based on the fields mapping between the form and PDF. This way, you save not just time but also a lot of resources, which may be needed in the case of developing and maintaining a system that allows you to render data into PDF files. Also, don’t hesitate to use Webhook as well, a feature that gives you the chance to download a PDF file on the spot, as soon as it generation is completed. The former API version, the API v2, will be withdrawn from use starting with the 1st of January 2019, due to the fact that it is outdated and depreciated. For more information about our latest API version, we kindly invite you to check our API documentation. It’s common that many PDF documents need to be filled in with some of the same information. For example, a lawyer may ask a client to fill in numerous PDFs with their personal information, such as name, address, phone number etc. Traditionally,, the lawyer would have to ask the client to write out their information again and again. But PlatoForms Master Form helps this. A master form is an online form, but, unlike our Web Online Form, it doesn’t need the PDF to be uploaded in advance. To build a master form, firstly, use our drag and drop form builder to create the layout. Then upload PDF linking to this master form. After the PDF has been uploaded, you need to map the fields from the master form to this PDF. We call this kind of PDF a Linked PDF. You can link any amount of PDF files to a master form. You can then publish the master form and its linked PDFs. PlatoForms gives you a shared URL or embedded script so you can share this form with your clients. After they have submitted a completed master form, its data are used to generate all linked PDF files. This means, as in the previous example, the lawyer creates a master form and links all PDFs that need the client’s personal information. After the clients fill out the one master form, all linked PDF files are created together! No need to ask clients to write their name and address five times! 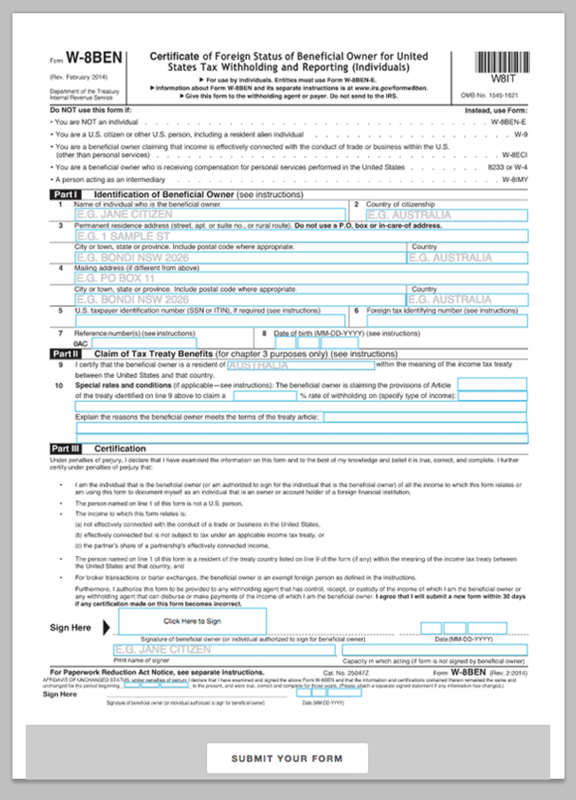 Like the normal form, you can view and download the PDF files from our Submission page. The download is a zipped package that includes all linked PDF files. Also, you can resubmit the master form to correct all linked PDFs at once. PlatoForms keeps all revision information so you can audit what modifications are made. Safe and easy! For more details, please check out our help documentation: MASTER FORM BUILDER. Some PDFs may be not filled at once, but completed in a few steps. For example, a car sale form needs to be filled out both the customer and the salesperson. It may also need the sale manager’s signature. With PlatoForms, you can build a workflow to achieve this. The workflow includes multiple forms – and we call each form a Step. A workflow can include any amount of steps. Once a form has been filled out, an email notification is sent to the correspondents, including a link to the next step. In most cases, the form in each step is the same PDF. The submission data is overlapping to the PDF created in the previous step. Think about above use case – it may take three steps in a workflow to complete this sale form. The first step is for the customer, where they fill in their personal information (e.g. family name, address, phone, etc.). The second step is for the salesperson, who will fill out the car information. The final step is for the sales manager, who will sign the form. All forms in these three steps are using the same PDF: the sale form. After the last step is submitted, they will have a completed PDF with all of the necessary information. Workflow is flexible with different settings. For example, you can decide if the current step data overlaps the previous step’s PDF. You can mix different form types, i.e. web online form or PDF online form. In above example, the first two steps could be designed in web online form format – this is easier for the customer and salesperson. In the last step, the sales manager can use a PDF online form. The background of the form is just that PDF with all of the customer’s and the salesperson’s information, so the manager is able to easily review and decide whether to sign or revise. In workflow you can use the same or different PDF files per step. The PDFs in any step can be found in PlatoForms Submission page and you get email notifications as well. In addition, by clicking the Workflow button on the top of Submission page, you can clearly understand the progress of your workflows, such as how many workflows have been submitted, how many steps have been completed, and so on. For more details, please check out our help documentation: WORKFLOW. We pleased to announce a new feature: you can share forms using your domain name URL! This feature is also called Custom Domain or Domain Name Masking. For example, the URL of your form was https://form.platoforms.com/frcaserswr. After set up, your form URL will be https://sales.yourdomainhere.com/form/frcaserswr. With this feature, you can easily hide platoforms.com from your customers. To utilise this feature, you must own a domain name and have permission to change its DNS records (i.e. adding CNAME records for your subdomain name). After you update the CNAME in your DNS registrar, our system will automatically install an SSL certificate to protect your form with HTTPS. Thanks to Let’s Encrypt, this certification is 100% free and we automatically handle everything for you, from installation to renewal. For more details on how to set up, please check out our help documentation: CUSTOM DOMAIN. Our current service converts your regular PDF into an online web form. This allows your clients to fill out a PDF without any hassle, as it becomes just a typical online form. However, building the form may be a challenge that will test your patience, especially if your PDF is complex. Today, we are pleased to announce a new way to create your PDF form online. In this new mode, you simply drag and drop the input elements into your PDF to make it fillable. Even if your PDF already has a fillable form, this process will take just a snap as our system automatically does this for you. After the PDF form has been built, you can also publish it as a web page, then either embed it in your website or share its URL. Your clients can then open the web page and fill and submit the form. It is as simple as it sounds. Here is the comparison of these two form creation methods: TRY THEM NOW. We transform your PDF form into a web form that is easy for everyone to fill out. Our web forms are compatible with all web browsers and they provide great mobile experiences and fast page loading. It will take more effort to build this form (as opposed to an online PDF) because you have to cover the web form and PDF mapping. This is easy to build, keeps all the details from your original PDF, and is suitable for any complex PDF form. This form is only compatible with the latest web browsers – like Chrome, Firefox, Opera, Safari, and Edge – not IE. The page loading speed could be slightly slower if your PDF has many images. We also have a great feature that was just released last month. If you don’t have a PDF just yet, you can always build one from scratch. We support most elements, regardless of their field type – text input, checkboxes, signatures, etc. Once you have completed the design of your PDF, you can convert it with one single click to our online web form^ or online PDF form. That’s all you need to do to allow your customers to complete it online! ^ You still need to map the PDF label to the web form label. For more details, please check out our help documentation: ONLINE PDF FORM BUILDER. I am pleased to announce PlatoForms can now make a PDF document from scratch. The PDF Maker is a drag-and-drop editor to create a PDF from scratch. It supports various form field types – e.g., input box, choice, dropdown, signature, etc. All of these fields can have customised properties, for example: font, size, colour, border, background, etc. The created PDF form will be read-only at this stage. To make it fillable, you can press the Make Online Form button on the editor function bar. PlatoForms will then convert this PDF to an online form. All PDF fields are mapped to relative online form fields. When your created PDF is converted to an online form, you need to bind the label, help text, or placeholder for the input fields. We try to make this as easy as possible, so all these inputs have auto-completed context text, which is extracted from your PDF. You can create unlimited PDF documents and this feature is totally FREE! For more details, please check out our help documentation: PDF MAKER. PlatoForms can convert any PDF form to online form, so your customers or colleagues can fill out an easy online form without having to install any specialist software! Let’s face it, your PDF form is far from ideal for your customers. Take Sally, she really wants to fill out your form to get going with your service. Many of your potential customers would fall at the first hurdle. They simply wouldn’t know where to start. But unlike most, Sally’s IT savvy. She eventually works out that she needs extra software to fill out your form. Oh, but then there’s the signature. Hmm, this is where her knowledge ends. Ultimately? It’s easier for Sally to print off the form and fill it out by hand. After all that, you receive emails with PDFs attached, scans, blurry photos and print outs through the post (if the post makes it to you, that is). You’ll need to fill some yourself, others you may struggle to make out. All that trouble, and your forms aren’t even searchable. Introducing PlatoForms - The online form solution for all your PDF woes. Upload your PDF – look to the left and see it transformed into an online form. Your customer completes your form. PlatoForms pings a notification to your inbox. Every single form entry will be slotted into a tidy management system which you can search, download, export and edit with ease. Discover a better way of working with forms. With our form builder you can create a form easily. But this is far from enough if you just simply append various input widgets into a form. Here we introduce some tips to improve the usability of your form, which will help your customers complete it more efficiently. This also makes your collected data more accurate. In a single line text input dialogue, you can choose the sub-type, e.g. number, email, date, date and time, URL, etc. Once you choose the sub-type, the input text is restricted to this particular type. For example, if you want to ask for the user’s email, the email sub-type will ensure that only the email addresses are accepted. If your PDF has options, the Choice widget is made just for that purpose. Depending on your requirements, you can set it as single or multiple choices. For example, in a car sale contract PDF there are two options: a one-month warranty or a three-month warranty. Obviously, the customer can only choose one of them. In this case, Single Choice is definitely the correct choice. You simply add the choice item – i.e. 1-month warranty and 3-month warranty – and turn off Multiple Choice. After that, your form only accepts users making one choice from the warranty options. You can use the most common scenarios for the dropdown options, for instance if the text input is Gender, City, Language, etc. which have only limited selections and you want the PDF to have consistent text. For example, you may put Female or Male as dropdown options in the gender box. If the form uses single line text, you may get various different inputs, such as, man, woman, boy, etc. That may be harder to work with as data and not what you were wanting..
All form widgets have this option. They automatically default to YES, meaning that your customer must fill in the field. However, in some cases, you may consider turning this off to make the field optional. In Multiple Line Text or Single Line Text, you can add some validations to restrict user input. The most common case is maximum or minimum length. This helps you to control what the user inputs in line with your expectations. We will give more details about validation in the next blog post. You can find more details in our help documentation: FIELD PROPERTIES. When your customer submits a form, our system will send you an email with the form generated PDF to your inbox. From our Submissions page, you can review the submission data and download or re-generate the PDF etc. You can also export the data. Click the Export Submissions button and select a date range to set the scope of submissions to download. Before exporting, our system cleverly tells you how many submissions are within your selected period. Click the Export button and a zip file will start to download within a few seconds. The package includes one or more CSV format files – if this form has multiple revisions, like if you have published this form multiple times, the zip file will include a different CSV for each revision of the form. You can open the CSV file with any plain text editor, MS Excel, or MacOS Numbers. All submissions of raw data are included, even the generated PDF URL. It is an easy alternative to our API if you want to import data into your system. For more details, please check out our help documentation: EXPORT FORM SUBMISSIONS. We pleased to announce that our form designer feature is released today! With our form designer, you can easily change form colour, font, size, layout, etc. It also supports embedded CSS to give you the super power to totally customise your form’s look and feel. To access our form designer, in the form builder page press the Preview Form button on the top navigation bar. In the new window, click the Form Design button on the top right. The form designer is presented as a sidebar on the left-hand side. It is extremely easy to use. All changes are immediately reflected on the form in the preview section. Once you are satisfied with the new UI, Apply the design to save it. Note that this won’t impact the sharing form if it was published before. The new look is only exposed to the public when you publish the form again. This means you won’t impact your customers with an intermediary work, and you can save your design work frequently. The form designer has two tabs. The first is Design, which is enough for most customisation requirements. If you want to have maximum control over your form, you can paste the CSS content in the second tab. All CSS in this tab has higher priority than defaults, meaning it will overwrite the existing styles. For more details, please check out our help documentation: FORM DESIGNER. In a PDF, you usually need a tick or cross to mark selections. Choice is the proper widget to fit in. There are two kinds of Choice: one is Checkbox, which allows multiple selections, and the other is Radio Button, which allows only one selection. From its properties dialogue, you can turn on/off the Multiple Choices option to switch between easily. Press Add Choice to add more items. Each item has a draggable square widget in the right-hand side PDF panel, just drag it to the proper location in your PDF. In the web form, each Choice item has a different label to tell what this option is for. Once it is selected in the web form, a tick or cross is rendered into your PDF at the location you dragged. With the Other Choice option you can add a text box in the web form, which is rendered as text in your PDF. For more details, please check out our help documentation: CHOICE PROPERTIES. It usually takes a while to create a form from scratch, especially, if your PDF is complex. It would be frustrating to rebuild the entire form if you only want to make some minor changes, for example, adding or removing a field, or changing the form layout slightly. With the Clone Form function, you can fix this easily. Clone form will reuse all the form widgets in the old version of your PDF. You only need to patch the revised part. For example, if you want to add a new text box in your PDF, after cloning the form you only need to insert a text widget in our form builder and drag it to the correct place in the PDF. It’s a breeze to publish the new version of your PDF. For more details, please check out our help documentation: CLONE FORM. In the form builder, you can fill in some data in the preview section in the field properties popup. For example, if you input “John Joe” into the text input field in the preview section and click the Fill Preview Data button in the top function bar at the web for preview page. Then this input field will be automatically filled with "John Joe" as sample data. This can save lots of your time when you want to preview generated PDFs after forms have been submitted. In the form builder page, "John Joe" is also rendered in your PDF when you press Preview PDF. Note, not all fields can set pre-filled data. Only SingleText, MultiText, Choice, Dropdown, and Signature can have sample data. For File Upload or Captcha, you always have to fill them in manually. For more details, please check out our help documentation: FORM PREVIEW. We pleased to announce that we are releasing our API today! This is our first version and it provides the functionality to retrieve your forms or submission information programmatically. More than API, we support the Webhook (https://en.wikipedia.org/wiki/Webhook) method to let our users receive real-time notifications when forms get new submissions. The API is protected by OAuth2 protocol. You need to log in to our dashboard – go to “Profile” -> “API Access”. Under this section, you can add an “OAuth2 Application”. As well as an application name you need to provide a redirect URL. After saving the application, we will generate a Client ID and Client Secret for your OAuth2 access. For more details about how to use OAuth2, check out its offical website. Digital ocean also has a very good article about OAuth2. In the “API Access” page you also can set up Webhook. Press “Add Webhook”, then input a name and your URL to listen to Webhook events. By default, that URL will be monitoring the submissions of all your published forms. After setup, once a new submission occurs and its PDF is generated, our platform will send a Webhook JSON message to your given URL. Inside the message will be the URL of the generated PDF. To download the PDF you need to follow same authorisation process of OAuth2. For more technical details and examples, please check out our API documentation. The API and Webhook are available on all our plans with different usage volume limitations. They are also free to use for our trial users.